It's hard to say whether Facebook's Messenger bots will ever make the platform the all-in-one tool of Facebook's dreams. But they're certainly not giving up on it, and the potential still looms large. Their latest bot development is the release of Messenger Platform 2.1, which includes a range of new tools designed to help enhance business use of Messenger, and enable the creation of better Messenger Bots. In-stream payments will be a big step for Messenger Bots, and their progress on this front will likely be ramped up in response to Amazon's reported move into messaging. 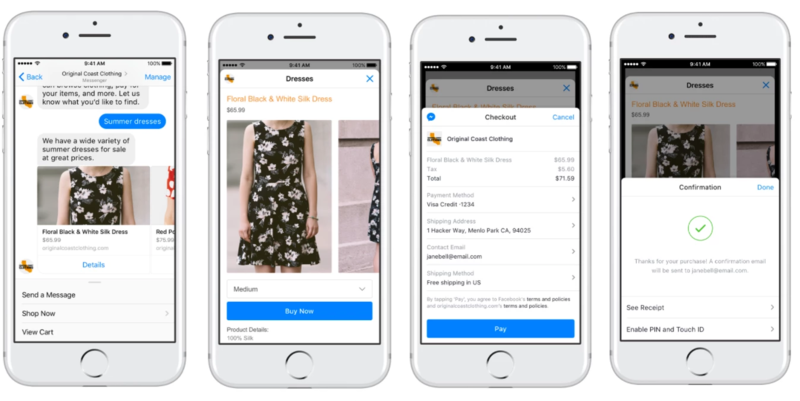 With their one-click purchasing options, Amazon could get a lot of attention in the space quickly, so it's not surprising to see Facebook working to advance their payments capacity. 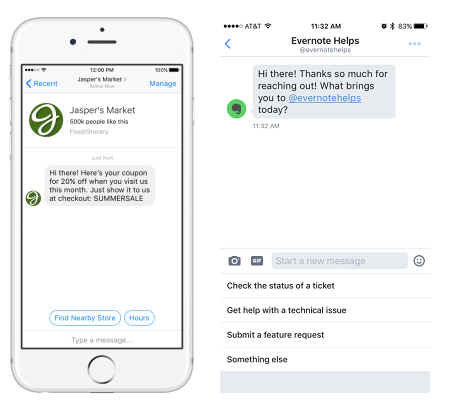 "Now, customers can pay using a one step process through Messenger webview." As you can see, the payments flow is simplified, which is another step towards encouraging more Messenger commerce. And while this is an interesting development, it may be more beneficial to see such an option on Instagram, which, combined with its coming Shopping Tags, could ensure Facebook remains a step ahead - or at least, on par - with anything Amazon can offer. 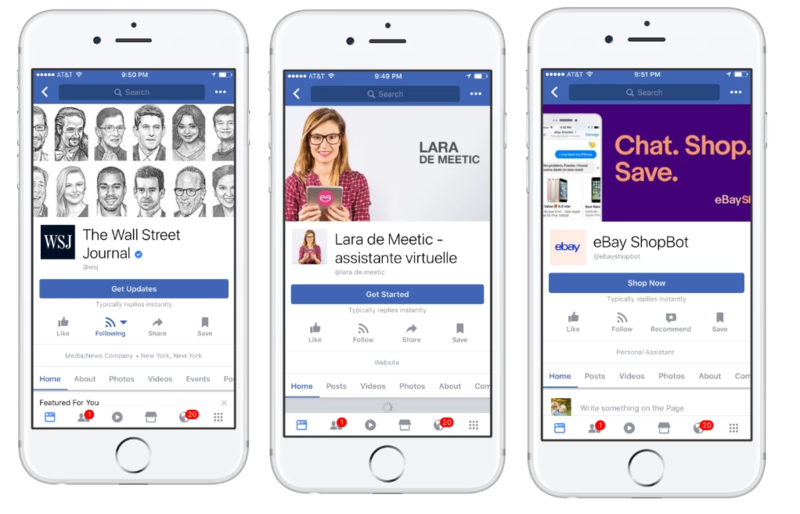 In a Messenger context, making it easier to make direct purchases, particularly in response to bots, is a major step - this announcement isn't the end goal for the process, but it's another advance. Also worth noting, payments on Messenger is still in beta and available in the US only. In order to encourage more Messenger business interactions, Facebook's also expanding the options for Facebook Page buttons which connect through to a Messenger thread. As you can see, there's now a wider range of call to action prompts which will take Page visitors direct to a Messenger conversation - or bot process. The purposes of each are fairly self-explanatory, and will help give users a better idea of what they can expect from a Messenger interaction - up till now, the only Page CTA button for Messenger has been 'Send Message'. One of the key stumbling blocks in the bot evolution is the high barrier for entry. Realistically, creating an intelligent bot flow which is responsive enough to provide user efficiency is hard, and requires development resources. Most platforms have recognized this, and have introduced buttons to help guide user flow, as opposed to relying on understanding the context of each query entered. The ideal of bots, however, is that they can understand every query, and you can just ask whatever you like, but that's still a way off - though it may be closer than you'd think. As part of this new announcement, Facebook's giving developers the opportunity to use in-built natural language processing (NLP) to recognize certain queries. "When Built-in NLP is enabled it automatically detects meaning and information in the text of messages that a user sends, before it gets passed to the bot. This first version can detect the following entities: hello, bye, thanks, date & time, location, amount of money, phone number, email and a URL." This may seem like a relatively minor addition, but the addition of NLP is a big step towards the next level of bots, and simplifying bot development. In alignment with this, Facebook's bot intelligence arm wit.ai has also announced that they're depreciating their current Bot Engine option to focus on further development of the in-built NLP. "We believe almost every bot should use NLP in some way to create delightful experiences." In effect, this means that Facebook's working to make it easier for all bot makers to utilize artificial intelligence tools, a move towards making bot development accessible to all. The next step in this will be simplifying the bot creation process even further, enabling more businesses to create their own bots. More bots means more bot promotion, raising awareness of the options and, ideally, expanded use. It's a more technical element of the process, and it doesn't make bots universally accessible to all businesses, but it's a step towards facilitating the wider adoption of AI elements and making smarter bots. In addition to these new tools, Facebook's also adding in some functional developments, including handover protocol to enable businesses to move seamlessly from an automated (bot) to a one-to-one (human) conversation, and desktop support for Messenger features, creating a more consistent experience across devices. As noted, it's hard to say whether bots will ever live up to Facebook's hopes. In the Facebook earnings call earlier this week, Facebook CEO Mark Zuckerberg discussed the potential of Messenger as viewed through the lens of Asian chat apps, which have seen huge success in becoming all-encompassing interactive/commerce hubs, and are viewed as the template Facebook's looking to replicate. "This is one of the rare times in business where you can look at messaging platforms that exist and see how they have monetized in other parts of the world and have that be the floor." But that, of course, considers that user behaviors can also be replicated, and there are various examples of processes that are common in one region, yet go virtually ignored in others. Cultural differences and technological adoption are key factors, and it is possible that even though it seems like it'll resonate eventually, Messenger commerce may never get there. Or it could come too late - a growing number of people are now conducting searches by voice, either via their phones or into digital assistants in the home, like Amazon's Echo and Google Home. If those devices take off, that could cause a habitual shift beyond Messenger bots before they even get a chance to take hold. On balance, both those scenarios seem less likely, it stands to reason that Messenger Bots will take off at some stage. When, exactly, that will be, no one knows, but Facebook's advances are significant, and could become crucial if we take that next step.